A ristotle was an ancient Greek philosopher and scientist born in the city of Stagira, Chalkidice, on the northern periphery of Classical Greece. His father, Nicomachus, died when Aristotle was a child, whereafter Proxenus of Atarneus became his guardian. At seventeen or eighteen years of age, he joined Plato's Academy in Athens and remained there until the age of thirty-seven (c. 347 BC). His writings cover many subjects – including physics, biology, zoology, metaphysics, logic, ethics, aesthetics, poetry, theater, music, rhetoric, linguistics, politics and government – and constitute the first comprehensive system of Western philosophy. 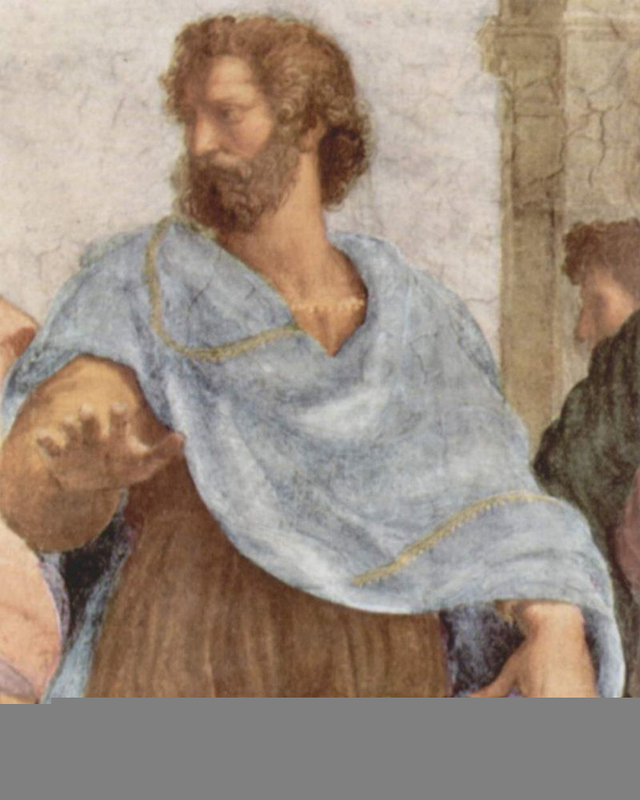 Shortly after Plato died, Aristotle left Athens and, at the request of Philip II of Macedon, tutored Alexander the Great beginning in 343 BC. Hayagriva dasa: Plato made a sharp distinction between the material and spiritual universes, but this dualism is not expressed by Aristotle. Since matter is simply one of God's energies, the finite reflects the infinite. Matter is a potency in the process of realizing itself. "Now hear, O son of Prtha, how by practicing yoga in full consciousness of Me, with mind attached to Me, you can know Me in full, free from doubt." ( Bg. 7.1) This is the process of Krsna consciousness. Of course, we may speculate about God, and if we just think of God, that will help to some extent. If we are in darkness, we may speculate and concoct ideas about the sun. This is one kind of knowledge. However, if we come out of the darkness and see the sun, if we come to the light, our knowledge is complete. We may contemplate the sun in darkness, but the best process is to come into the sunshine and see for ourselves. Hayagriva dasa: Aristotle does not believe that material objects are trying to realize God, as Plato does, but that God is realizing Himself through material objects, and God does this in a variegated and infinite way. God realizes the potentiality of a flower, or of a man, by creating a flower or a man perceivable by the material senses. So, in a sense, the world is more real to Aristotle than to Plato. Srila Prabhupada: Since God has created the material world with all its variety, He is in full awareness of how to act properly. That is God's perfection. He knows how to do everything perfectly and in a natural way. A child naturally knows how to put food into his mouth. He does not have to learn this. God's knowledge of everything is already there. It is not that He has to receive this knowledge through some source, or by creating. He is already fully aware of these things. He doesn't have to realize Himself or His potentiality through matter. Hayagriva dasa: Aristotle would say that a flower is real because it has its basis in the ultimate reality, God. Srila Prabhupada: If God is the ultimate reality, how is it He is not in full knowledge of everything at all times? There is no question of realizing Himself through matter. Hayagriva dasa: Plato would say that a flower is but a shadow of reality. Which point of view would be closer to the Vedic version? Srila Prabhupada: Whatever is in the material world is but a perverted reflection of the spiritual world. It is our experience that in the material world, objects are created, but in the spiritual world, nothing is created. Everything is there everlastingly. Syamasundara dasa: Aristotle says that imperfection is inherent in the substance matter. Because man is made of matter, he must be imperfect. Srila Prabhupada: Man is not made of matter but is covered by matter. Man is made of spirit. If God is spirit, man is also spirit. In the Bible, it is also said that man is made in the image of God; therefore man is originally perfect. A person is generally supposed to be healthy, but if he falls into a diseased condition, it is not his imperfection. It is something external that has attacked a healthy man. According to his original nature, man is healthy. Syamasundara dasa: For Aristotle, the goal of action is to realize our potential and attain the greatest happiness or pleasure. Since God created man for self-realization, it is realization that will bring him satisfaction. Srila Prabhupada: This means that in the beginning God created man imperfect. Otherwise, why is there need for self-realization? Syamasundara dasa: A piece of wood has the potential to become fire. It is not fire until it is kindled. Man is similar. Srila Prabhupada: We say that the living entity is part and parcel of God, and if God is all good, the living entity is also all good. A part of gold cannot be iron; it also must be gold. However, the part is not equal to the whole. A gold earring is also gold, but it is not as great as the gold mine. Nevertheless, the quality of the gold earring and the quality of gold in the gold mine are the same. If God is perfect, the living entity must also be perfect in quality. If God has the quality of goodness, the living entity must have it also. Why should he be imperfect? That would indicate that God is unjust. Why should God create something that has to come to the perfectional point by realization? Syamasundara dasa: Aristotle would say that the activities of the mind are pure and perfect, but that those of the body and matter are impure and imperfect. Therefore one must realize himself through the activities of the mind alone. Srila Prabhupada: No, the mind is never perfect. The mind's business is to accept this and reject that, and therefore it is very flickering. The mind is subtler than the body, but the mind is not the soul, nor is the mind perfect. Above the mind there is intelligence, and above the intelligence there is the soul. That soul is perfect in quality, and it has all the qualities of God in minute quantity. Syamasundara dasa: By mind, Aristotle means the rational faculty of intelligence. Srila Prabhupada: Intelligence is above the mind. Intelligence controls the mind, and intelligence is of the soul. Therefore the whole background is the soul. Syamasundara dasa: The mind must act or contemplate in accordance with logic. Logic is defined as the method of drawing correct inferences. Srila Prabhupada: The mind may logically accept something and again logically reject it. Where, then, is perfect logic? Syamasundara dasa: Perfect logic is simply a method for finding the truth. Srila Prabhupada: But the mind is constantly accepting and rejecting. How can it ascertain the truth according to logic? If our authority is the mind, does this mean that the mind of everyone is an authority? The mind may constantly search, but it will never be successful because the truth is beyond its reach. A follower of the Vedas does not accept this speculative method as a path to truth or perfection. Hayagriva dasa: For both Plato and Aristotle, God is known by reason, not by revelation or religious experiences. Srila Prabhupada: We are all limited, and God is unlimited; therefore we cannot understand God by our limited sensory powers. Consequently, God must be known by revelation. "I am never manifest to the foolish and unintelligent. For them I am covered by My eternal creative potency [yoga-maya]; and so the deluded world knows Me not, who am unborn and infallible." (Bg. 7.25) It is a fact that unless God reveals Himself, He is not known. Therefore He appears, and great authorities like Vyasadeva, Narada, Sukadeva Gosvami, Ramanujacarya, Madhvacarya, and Caitanya Mahaprabhu—great scholars and transcendentalists—accept Him as He reveals Himself. Arjuna saw God face to face, and he accepted Him. When we are freed by our service, God reveals Himself. Hayagriva dasa: Well, Aristotle emphasizes man's use of reason, and he sees man's happiness depending on acting in a rational way, which is the way of virtue and intellectual insight. There is a suggestion of sense control, but no bhakti. Is it possible to attain happiness simply by controlling the senses with the mind? Srila Prabhupada: Yes, and that is the process of becoming a human being. Animals are ignorant of this process, and they act only for their sense gratification. Their only business is eating, sleeping, mating, and defending. Through proper guidance, a human being can engage in contemplation, but he should be guided by authorities, otherwise he may contemplate with his limited senses for many millions of years and not be able to understand God. Hayagriva dasa: But for happiness, or ananda, isn't bhakti essential? Srila Prabhupada: God is full ananda, full bliss. Sac-cid-ananda. He is eternal and in full knowledge of everything. Unless we come in contact with God, there is no question of ananda. Raso vai sah. [Taittiriya Up. 2.7.1] From the Vedic literatures, we understand that God is the unlimited reservoir of all pleasure; consequently, when we come in contact with God, we will taste that pleasure. Material pleasure is only a perverted reflection of the real pleasure. Syamasundara dasa: Rather than personal guidance, Aristotle emphasized rational logic. Srila Prabhupada: Yes, but when you are guided, you have to sacrifice your logic to accept the superior logic of your guide. Syamasundara dasa: He felt that the mind can be its own guide. Srila Prabhupada: As I said, the mind will carry you this way and that. In Bhagavad- gita, Arjuna says that the mind is more difficult to control than the wind. If a horse is not controlled, if it is allowed to run at will, it will cause some disaster. When the horse is guided, it can take you to your destination. We should therefore know how to control the mind by the intelligence. Syamasundara dasa: But because the mind is an aspect of God, we find our perfection or happiness in the contemplation of God. Srila Prabhupada: Everything is an aspect of God. In Bhagavad-gita, Krsna points out that He has eight separated energies. So why stress the mind? Because we have lost God's association, we are all searching after Him. We are struggling, but we do not know why. This is due to ignorance. If, by good fortune, we chance to meet a bona fide guru, the guru can inform us, "You are searching after God. This is the way. You only have to follow." It is then that we can become happy. Syamasundara dasa: Aristotle believed that the truth is inherent or innate within everything. For him, truth is the agreement of knowledge with reality. It corresponds with things in the objective world. Srila Prabhupada: If truth is within everything, then it must be drawn out. However, it is not drawn out by matter but by spirit. This means that the help of a superior energy is necessary. According to Bhagavad-gita, the living entity is the superior energy, and matter is the inferior. It is the inferior energy that must be controlled by the superior. Both God and the living entities are eternal, but God is the Supreme Eternal. Living entities are nitya-krsna-dasa, eternal servants of God. When they tend to disobey God, they suffer. If we want to use our logic, we can understand that through our independent action, we have failed. Therefore we must take the advice of superior intelligence. That advice is given in Bhagavad-gita. It is not that we can attain the truth through our own independent speculation. If we want to know who our father is, we may speculate forever, but it is much simpler to ask our mother. Otherwise we may go on searching and searching for millions of years and never know. What is the point in all this vain research? We should conclude that insofar as we are in the material, illusory condition, it is our duty to take help from God or His representative, who does not set forth anything that is not originally spoken by God. For instance, God says, "Surrender unto Me," and God's representative says, "Surrender unto God." If a rascal says, "I am God," he should be kicked. The living entities are part and parcel of God, and a part can never become the whole. A real representative of God acknowledges himself as the servant of God, and he requests everyone to surrender unto God. For perfect knowledge, we have to take guidance either directly from God, as Arjuna did, or from God's representative. Then we will be successful in ascertaining the truth. Hayagriva dasa: Aristotle outlines three different conceptions of the soul: one, the soul itself is a separate substance; two, the body is but the instrument of the soul; and three, the soul is the actual form of the body. Srila Prabhupada: The body is like the clothes of the soul, and our clothes are designed to fit our body. A coat has arms because we have arms, and pants have legs because we have legs. So the body is like the coat and pants of the soul, and since the body has form, the soul also has the same form. The cloth, which is the body, originally has no shape, but when it comes into contact with the soul, it assumes a shape. Syamasundara dasa: It appears that Aristotle equates the soul with the intelligence. Srila Prabhupada: The soul has intelligence, but his intelligence is misused if it is limited to the mind. The intelligence should rise above the mind. The mind is superior to gross matter, the intelligence is superior to the mind, and the soul is superior to the intelligence. Superior to the soul is the ultimate cause of the soul, the Supreme Lord. Syamasundara dasa: Because he equates the soul's immortality with reason, Aristotle believes that it is only the rational soul, the human soul, that is immortal. Animals also have souls, but he saw them limited to sense, desire, and animation. Srila Prabhupada: Animals are also rational. If a dog enters my room, and I say, "Out!" the dog immediately understands and goes away. How can we say that there is no rationality at work? If I place my finger before an ant, that ant will turn away immediately. If you give a cow meat, the cow will not touch it. The cow understands that its food consists of grasses and grains. Animals have rationality, but one aspect of rationality is lacking: an animal cannot think of God. This is the main difference between animals and men. A man's rationality is so developed that he can think of God, whereas an animal cannot. But we should not think that the souls of animals are not immortal. This theory has given the Christians a basis for killing animals, but they cannot prove that an animal's soul is irrational or mortal. A man eats, sleeps, defends, and mates, and an animal does the same. So what is the difference? Syamasundara dasa: Perhaps the difference is one of mental activity. A man has the capacity to think in a more complicated way. Srila Prabhupada: But mental activity means accepting and rejecting. Animals also accept and reject; therefore they have mental activity. Syamasundara dasa: But what of developed intelligence? Srila Prabhupada: Of course, man has a more highly developed intelligence, but we should not think that an animal has no intelligence at all. The father has more intelligence than his small child, but this is because the child has not grown to attain that standard. Similarly, an animal is making progress up the evolutionary scale. It has intelligence, but it is not highly developed. Plants, animals, and men possess consciousness. It has been proven by Doctor Jagadish Candra Bose that a tree is conscious of your cutting it. However, the tree does not feel it very much. If you hit an animal, the animal feels it more, and if you hit a man, a man feels it even more than an animal. It is a question of developed consciousness, of developed intelligence. That development has to do with the body. As soon as you receive the body of a tree, your consciousness is plugged up. It is not so active. When you attain the human form, consciousness is more developed, and that developed consciousness should be further developed so that you can come to Krsna consciousness, which is the highest perfection of the living entity. Syamasundara dasa: Aristotle conceived of the soul as having a dual nature. There is an individual soul, which awakens at birth and acquires impressions during one's lifetime. Thus it grows and develops, but it is not eternal. It is subject to conditioning. It is like the souls of animals. Then there is also a rational soul, the active soul, which is eternal, though not perfect. This is man's motivating principle and purpose for living. "Many, many births both you and I have passed. I can remember all of them, but you cannot, O subduer of the enemy!" (Bg. 4.5) That is the real meaning of eternity—eternal knowledge. Thus there are two kinds of souls: the Supersoul (Paramatma), who is Krsna Himself, and the ordinary soul (jiva), which is possessed by every living entity. Syamasundara dasa: For Aristotle, the rational soul is eternal, yet he says that it is not perfect. Srila Prabhupada: This means that he has to accept two souls, one perfect and rational, and another imperfect and irrational. The soul that is perfect and rational is Krsna, the Supersoul. Syamasundara dasa: He doesn't say anything about the Supersoul accompanying the individual soul. Srila Prabhupada: That is because he does not know. He suggests that there is a dual nature, but he has no idea. The dual nature he refers to is not of the soul but the mind. The soul is one. When you are on the mental platform, it appears that the soul has a dual nature, but when the soul's perfection is attained, you think only of Krsna. There is no question of duality. Hayagriva dasa: In Politics, Aristotle writes: "The beauty of the body is seen, but the beauty of the soul is not seen." Is this true? Srila Prabhupada: The beauty of the soul is real, and the beauty of the body is superficial. In the material world, we see many ugly and many beautiful bodies, but here ugliness and beauty are artificial. The beauty of the soul, however, is real, not artificial. Unless we see the beauty of the Supersoul, Krsna, we have no idea what actual beauty is. Therefore the devotees want to see the beauty of Krsna, not the artificial beauty of this material world. Hayagriva dasa: Is there no correspondence between a beautiful body and a beautiful soul? Aren't they linked by karma? Srila Prabhupada: There is some correspondence because we say that this material world is a perverted reflection of the spiritual. Originally, the soul is beautiful, but here that beauty is covered. We can only have a glimpse of the real beauty from the material covering, but we have to wait in order to see the actual beauty of the soul. That beauty is the real form of the body. Hayagriva dasa: It is said that Socrates was physically ugly but that he had a very beautiful soul, and consequently people were attracted to him. Srila Prabhupada: In India, it is said that the quail is black and ugly like a crow, but when it sings, its song is so beautiful that people are attracted. The beauty of the body is secondary, and the beauty of the soul is primary. A beautiful man who is a fool is beautiful only as long as he does not speak. As soon as he speaks, we can understand his actual position. Essentially, external beauty is useless. If an ugly man speaks well, he attracts many people, and if a beautiful man speaks nonsense, no one cares for him. Real attraction is one thing, and artificial attraction is another. Syamasundara dasa: In man's search for truth, the role of logic is paramount. According to Aristotle's principle of contradiction, a proposition cannot be both true and false at the same time. Srila Prabhupada: That is on the relative platform. At one time we may accept something to be true, and at another time we may reject it as untrue. On the mental platform we cannot know what is true and what is not. Therefore we have to learn the truth from the Supreme Truth. Truth is truth. It is not subject to speculation. In Bhagavad-gita, Krsna says that after many lives of speculation, the man of wisdom surrenders unto the Supreme Absolute Truth. In the beginning, a man may employ deductive logic, but in the end, he surrenders. He comes to the conclusion: Vasudevah sarvam iti (Bg. 7.19). "God is everything; therefore I must surrender." This is the perfection and ultimate end of the mental processes of speculation. That is, speculation is abandoned. Syamasundara dasa: Aristotle more or less utilizes the process of sankhya- yoga by analyzing objects and placing them into general categories. These categories become more and more general until one reaches the final cause, or ultimate category. Srila Prabhupada: Yes, this is the process of neti-neti, by which one eventually hopes to attain Brahman by understanding what Brahman is not. According to this process, one goes through the universe saying neti-neti, "This is not Brahman, that is not Brahman. This is not truth, that is not truth." This is the same inductive process. For instance, if you want to determine whether or not man is mortal, you may search from man to man and conclude whether each man is mortal or not. In this way, you can go on indefinitely seeing that all men are dying. Then why not accept the fact that man is mortal? In your attempt to find an immortal man, you are bound to be frustrated. You will only find mortality. This is the result of the neti-neti process. Syamasundara dasa: The idea is that through this process, we can come to the final cause, the final category. Srila Prabhupada: The final category is that we are part and parcel of God. That's all. Syamasundara dasa: Aristotle believed that matter as such has an inherent design. If it did not, it would be devoid of shape or form. Brute matter has to be activated; otherwise it would remain in a dormant state of nonexistence. Matter must be acted upon from without in order to be realized. Srila Prabhupada: This means that the Supreme Absolute must have form.Isvarah paramah krsnah sac-cid-ananda-vigrahah ( Brahma-samhita 5.1). The word vigraha indicates form. That form is not dead but is the activating spirit. Krsna's form is sac-cid-ananda, eternal, fully cognizant, and blissful. Our bodies are neither fully cognizant nor fully blissful, but Krsna's is. He knows past, present, and future, and He is always happy. Our knowledge is limited, and we are always full of anxieties. Syamasundara dasa: For Aristotle, a form has innate purpose, or entelechy. Therefore all matter has some form for its actualization. The world is an unfolding of phenomena realizing itself. In other words, nature has a purpose. Srila Prabhupada: We agree with this. According to Padma Purana, there are 8,400,000 various forms, and none of them are accidental. By karma, one receives a particular type of form. Brahma receives his form according to his karma, and the dog or cat receives his form according to his. There is no question of accident. Nature unfolds in accordance with a plan, by virtue of which these various forms are existing. "Let me offer my respectful obeisances unto the original Personality of Godhead, Govinda, who regulates the sufferings and enjoyments of fruitive activity for everyone: from the heavenly King Indra down to the smallest insect [indra-gopa]. That very Personality of Godhead destroys the fruitive karma of one engaged in devotional service." ( Brahma-samhita, 5.54) From Indra down to indra-gopa, a microscopic germ, all living entities are working out the results of their karma. If one's karma is good, he attains a higher form; if it is not good, he attains a lower form. Syamasundara dasa: Aristotle also believed that everything is designed by God for the attainment of some particular objective. This indicates a grand scheme. Srila Prabhupada: This is the process of evolution. The living entity passes from one species to another, from trees to vegetables, to insects, to fish, birds, beasts, and humans. In the human form, evolution is fully manifest. It is like a flower unfolding from a bud. When the living entity attains the human form, his proper duty is to understand his lost relationship with God. If he misses this opportunity, he may regress. Aristotle is correct therefore in saying that everything has a purpose. The whole creative process aims at bringing the living entity back to Godhead. Syamasundara dasa: Does everything eventually come to that point? Srila Prabhupada: As a human being, you can properly utilize your consciousness, or you can misuse it. That is up to you. Krsna gives Arjuna instructions and then tells him that the decision is up to him. Under the orders of Krsna, nature has brought you through so many species. Now, as a human, you have a choice whether to return to God or again undergo the cycle of birth and death. If you are fortunate, you make the proper choice according to the instructions of the spiritual master and Krsna. Then your life is successful. Syamasundara dasa: Aristotle sees a hierarchy of forms extending from minerals, vegetables, animals, to human beings, and ultimately God, who is pure form and pure act. God is devoid of all potentiality, or materiality. Srila Prabhupada: There is no guarantee that we will move upwards in that hierarchy. It is a fact that the individual soul transmigrates from one form to another, but how can you say that the next form you attain will be closer to perfection? If you have a human form in this life, there is no guarantee that you will get a higher form in the next. You accept another form just as you accept another dress. That dress may be valuable, or of no value whatsoever. I get a dress according to the price I pay, and I accept a form according to my work. Syamasundara dasa: But in order to attain perfection, we must move toward God. This is the goal for which the living entity is initially created. Srila Prabhupada: This is very expertly explained in Vedic literature as karma, akarma, and vikarma. You bring about your own form. You enjoy or suffer according to your work. In any case, a material form is never perfect because it undergoes six changes. It is born, grows, it stays for a while, it leaves some by-products, dwindles, and then vanishes. When your form vanishes, you have to take on another form, which also undergoes the same processes. When a form vanishes, it decomposes, and various elements return to nature. Water returns to water, earth returns to earth, air returns to air, and so forth. Syamasundara dasa: Aristotle's God is the unmoved mover. He is perfect, and He wants nothing. He does not have to actualize Himself because He is completely actualized. Srila Prabhupada: We also agree that God is all perfect. Parasara Muni defines God as the totality of wisdom, strength, wealth, fame, beauty, and renunciation. All these qualities are possessed by Krsna in full, and when Krsna was present, anyone could see that He was all perfect. One who is perfect can rule others, and we accept the leadership of a person according to his degree of perfection. If one is not somewhat wise, beautiful, wealthy, and so forth, why should we accept him as a leader? One who is supremely perfect in all these qualities is the supreme leader. That is natural. Since Krsna is supremely perfect, we should accept Him as our leader. Syamasundara dasa: Aristotle sees God as pure thought (nous). God's life is the life of the mind, but God does not need to do anything to further perfect Himself. Srila Prabhupada: When he says that God is mind, what does he mean? Does he have some conception of God's personality? God must be a person. Otherwise, how could He think? Syamasundara dasa: Aristotle sees God as constantly engaged in self-contemplation. Srila Prabhupada: Does this mean that when one is perfect, he engages in no activity? Does God simply sit down and meditate? If so, what is the difference between a stone and God? A stone sits; it has no activity. How is inactivity perfection? Krsna never meditates, yet when He speaks, He delivers perfect knowledge. Krsna enacts various pastimes: He fights with demons, protects His devotees, dances with the gopis, and delivers words of enlightenment. There is no question of God sitting down like a stone and engaging in self-meditation. Syamasundara dasa: But is it not possible to meditate while acting? Srila Prabhupada: Certainly, but God doesn't have to meditate. Why should He meditate? He is perfect. Meditation means coming from the imperfect stage to the perfect stage. Since God is perfect to begin with, what business does He have meditating? Everything is actualized by His will alone. Syamasundara dasa: Doesn't He contemplate His own activities? Srila Prabhupada: Why should He if He is perfect? Aristotle recommends that a man should meditate to become perfect. This meditation presupposes imperfection. Contemplation is recommended for living entities, but we should understand that whatever God desires or wills immediately comes into being. This information is given in the Vedas. Parasya saktir vividhaiva sruyate [Svet. 6.8]. God's multi-energies are so powerful that everything is immediately actualized as soon as He desires. Syamasundara dasa: But what about the meditations of the Buddha? Srila Prabhupada: Buddha's mission was different. He was setting an example for miscreants who were engaged in mischievous activities. He was recommending that they sit down and meditate, just as you tell a mischievous child to sit in a corner and be quiet. Syamasundara dasa: Well, Aristotle isn't saying that we should put an end to our activities. Rather, we should always contemplate God. We should always think of Visnu. Krsna consciousness means remembering Krsna and acting for Him. When you sweep Krsna's temple, you remember Krsna. When you cook for Krsna, you remember Krsna. When you talk about Krsna, you remember Krsna. This is also the process recommended in Bhagavad-gita. The topmost yogi is always thinking of Krsna. Hayagriva dasa: For Aristotle, God essentially does not have any knowledge of the world, and consequently He cannot return the love He receives. He neither loves nor cares for mankind. "All of them—as they surrender unto Me—I reward accordingly. Everyone follows My path in all respects, O son of Prtha." (Bg. 4.11) When we fully surrender to God in loving service, we can understand God's nature. Hayagriva dasa: For Aristotle, God is loved by everything in the universe, and He attracts all objects in the universe just as a magnet attracts nails. Everything is striving toward Him and longing for Him, but there is no mention of Him as a person. Yet Aristotle speaks of God as pure form. Would this be an imagined form like that of the Mayavadis? Srila Prabhupada: Yes, it appears that Aristotle is Mayavadi. One has to speculate if he does not receive perfect knowledge from God Himself. Unless God is all attractive, how can He be God? Therefore the word "Krsna," which means "all attractive," is the perfect name for God because God is attracting everyone. In Vrndavana, He attracts His parents, the cowherd boys and girls, the animals, the fruits and flowers, the water—everything. You have read the descriptions of how the water of the Yamuna stopped flowing as soon as she saw Krsna. So even the water was attracted to Krsna. Syamasundara dasa: Aristotle believed that thought and activity are one with God. There is no dualism because God is pure act and pure thought. Srila Prabhupada: Yes, that is so. God only needs to think of a thing for that thing to be created or actualized. God's thinking, feeling, willing, and acting are the same. Because I am imperfect, when I think of something, it may or may not happen, but whenever God thinks something it takes place. Because Krsna thought that the battle of Kuruksetra should take place, there was no stopping it. At first, Arjuna declined to fight, but Krsna plainly told him that whether he fought or not, most of the people there were destined to die. He therefore told Arjuna to become an instrument and take the credit for killing them. No one can check whatever God decides. It doesn't matter whether you help God or not, but it is for your interest that you become His instrument. Syamasundara dasa: Aristotle says that one should perform his activities in such a way that he is always contemplating God. Srila Prabhupada: Yes, that is the process of bhakti. Unless one is a devotee, how can he constantly think of God? Rupa Gosvami gives the example of a woman who has a paramour other than her husband. She performs her household chores very nicely, but she is always thinking, "When will my lover come at night?" If it is possible to think of someone like this all the time materially, why not spiritually? It is a question of practice. Despite engaging in so many different types of work, you can think of God incessantly. Now, Aristotle may have some conception of God, but he has no clear idea of Krsna's personality. We can think specifically and concretely of God because we receive information from Vedic literature that God is a person and appears a certain way. In Bhagavad-gita, it is stated that impersonalists experience a great deal of trouble because they have no clear idea of God. "For those whose minds are attached to the unmanifested, impersonal feature of the Supreme, advancement is very troublesome. To make progress in that discipline is always difficult for those who are embodied." (Bg. 12.5) If you have no conception of God's form, your attempt to realize God will be very difficult. Syamasundara dasa: Aristotle conceives of God as the greatest good, as pure thought. When we act, we should always contemplate the good. In this way, we can lead a godly life. Srila Prabhupada: You cannot contemplate the good unless you are guided by the good. Arjuna, for instance, was guided by the Supreme Good; therefore despite his activity, which was fighting, he performed the greatest good. Syamasundara dasa: Aristotle believes that there is a grand design in the universe because everything is evolving from one form to another to realize its most perfect form. Everything is being attracted by the most perfect form. Srila Prabhupada: Does he say that there is only one perfect form, or a variety of perfect forms? What does he mean? Is everyone striving to come to the perfect form? Is that form one or various? Syamasundara dasa: Well, since each material form is designed by God and moves toward God in its longing for perfection, there must be a variety of forms. Srila Prabhupada: If that is the case, it tallies with the Vedic conception. We say that Krsna and His associates are perfect; therefore this flower, for instance, attains its perfect form when it is in Krsna-loka, Krsna's planet. Everything in Krsna-loka is perfect because everything there is directly related to Krsna. Consequently, in Krsna-loka, the Yamuna River, the Vrndavana forest, the flowers, the beasts, the birds, and the men and women are nondifferent from Krsna. When Brahma stole all the cowherd boys and calves, Krsna immediately expanded Himself into many cowherd boys and calves, each with different features and mentalities. The mothers of the cowherd boys could not understand that their real sons had been stolen. Because Krsna was substituting for them, the mothers' love for their sons increased. Thus Krsna can expand Himself in many ways—as cows, calves, trees, boys, girls, and so on. Yet Krsna is still one. Syamasundara dasa: Aristotle would say that since God has a spiritual form, He is without plurality in the sense that He is composed of no parts. In other words, He is pure spirit. Srila Prabhupada: Yes, God is one without plurality. The sun may be visible to millions of persons, still the sun is one. At noon, millions of men may claim, "The sun is over my head," but does this mean that everyone has a different sun? No, the sun is one, but the sun can represent itself variously. Syamasundara dasa: Aristotle gave two arguments for God's existence. One is that there is a design in the universe, and a design presupposes a designer. The other holds that there must be a first cause, a cause of all causes. Hayagriva dasa: In Nicomachean Ethics, Aristotle writes: "Moral excellence is concerned with pleasure and pain; it is pleasure that makes us perform base action, and pain that prevents us from acting nobly. For that reason, as Plato says, men must be reared from childhood to feel pleasure and pain at the proper things. This is proper education." How does this correspond to the Vedic view of education? Srila Prabhupada: According to the Vedic view, there is no pleasure in this material world. We may make all kinds of arrangements for pleasure, but we may suddenly have to die. So where is the pleasure? If we make arrangements for pleasure and then do not enjoy it, we are disappointed. We are constantly trying to attain pleasure by inventing so many contrivances, but because we are controlled by some superior force, we may at any moment be kicked out of our house of pleasure. The conclusion is that there is no pleasure in this material world. Pleasure here is an illusion, a mirage. In a desert, you may hallucinate water, but ultimately you will die of thirst. Syamasundara dasa: For Aristotle, virtue is the golden mean, or that activity between two extreme activities. By his intelligence, man can perceive and act upon that golden mean. Ultimately, all virtues are summed up in the virtue of justice, which means doing the right thing for everyone concerned so that everyone's rights will be protected. Srila Prabhupada: But if everyone's rights are to be protected, how can you kill animals? Why shouldn't animals have the right to live? According to the Vedic conception, even if you kill one ant unconsciously, you are responsible. Because we are killing so many ants and microbes unconsciously, we therefore have to perform panca-yajna, sacrifice. We may consciously avoid killing animals, but we may be unconsciously killing many. Therefore, in either case, sacrifice is compulsory. Syamasundara dasa: Aristotle believes that virtue can be analyzed, that any situation can be analyzed by the intelligence, and then that intelligence can be applied to correct action. Srila Prabhupada: By intelligence he should try to understand whether or not animals have souls. If an animal doesn't have a soul, how is it he is acting like a human being? He is eating, sleeping, mating and defending. How can you say he has no soul? The life symptoms are the same. Syamasundara dasa: He equates the immortal soul with rational activity. Does this mean that God is the father only of human beings? For instance, the Jews say that they are the only selected people of God. But what kind of God is this who selects some people and condemns others? This is God: Krsna says, sarva-yoni. "I am the father of all species of life," Everyone is God's son. How can I kill and eat any living entity? He is my brother in any case. Suppose a man has five sons, and two of them are fools. Does this mean that the intelligent sons have the right to kill and eat the foolish ones? Would the father like this? Who would ask the father, "Father, these two sons are fools and useless rascals. So let us cut them to pieces and eat them."? Will the father agree to this? Or will the state agree? And why should God agree? Syamasundara dasa: Aristotle claims that one can use his intelligence to practice virtue, but you once said that because a thief considers theft a virtue, he can use his intelligence to steal. Srila Prabhupada: Yes, a thief's intelligence has been described as duskrtina. The word krti means "very meritorious," and the word dus means "misapplied." Is that virtuous when one's intelligence is misapplied? When merit and intelligence are properly used for the proper activity, that is virtue. Such activity will not entangle a man. That is intelligence and virtue. Syamasundara dasa: Ambition is one of the Aristotelean virtues, but one can have the ambition to steal. Srila Prabhupada: Yes, it was Hitler's ambition to become total ruler of Europe. He killed many people and then finally killed himself. So what was all this ambition worth? All these politicians are very ambitious, but they are ambitious to unlawfully encroach upon the rights of others. We should have the ambition to become the sincere servant of God. That is real ambition. Syamasundara dasa: Among virtues, Aristotle includes courage, temperance, liberality, magnificence, and ambition. Srila Prab hupada: What is the magnificence of killing animals? How can you have no kindness for poor animals and yet talk of magnificence? Harav abhaktasya (Bhag. 5.18.12). If your ultimate conclusion is not God consciousness, you have no good qualities. You can be neither a scientist, nor a philosopher, because you are naradhama, hovering on the mental platform. Thus you concoct so many theories. Syamasundara dasa: As far as Aristotle's social philosophy is concerned, he says that man is basically a political and social animal and that he must exist in some society in order to fulfill himself. Men live together to transcend their crude natural condition and arrive at a civilized culture of ethical and intellectual life. Srila Prabhupada: If that is done, that is all right, but he is philosophizing that animals have no souls. Following his philosophy, people are saying, "Let's kill the animals and eat them." So what is the benefit of this grouping together in a society? We should instead group together to cultivate knowledge of God. This is what is required. What is the use in living together just to plunder other nations and kill other living entities? Such a group is a group of rogues and gangsters. Even today in the United Nations people are grouping together and planning to encroach upon one another. So what is the point in all these groups of gangsters? Syamasundara dasa: Aristotle is talking about the ideal way a state or a political body should be organized. He says that ideally a state should be formed in order to educate men to the highest level. Srila Prabhupada: But if we do not know what is education, or if we do not know the highest level of education, or if we do not even know the primary principles of a virtuous life, how can we speak of such things? Therefore we should be very careful to take bona fide guidance. According to Vedic civilization, Manu is the law-giver, and he is considered perfect. Manu, for instance, states that a woman should not be given independence. Now, certain groups are asking, "Why not?" Thus there is a confrontation, and Manu is surely being attacked, but Manu's conception is right in any case. Instruction should be taken from liberated persons. What can a group of fools do? One liberated personality like Manu can give the right directions. Presently, in the name of independence, there is havoc. Syamasundara dasa: Aristotle's state would be tightly controlled either by a monarch or a group of men intellectually and morally superior. These would guide the rest of the people. Srila Prabhupada: Yes, that would be very nice. Unless one is morally superior, he cannot guide. Nowadays, in democracies, all kinds of rascals are voted into positions of authority. What is the use in such groups? Syamasundara dasa: Aristotle condemns democracy because in a democracy each person strives for his own self-interest. Srila Prabhupada: Yes, that is going on. Monarchy is good if the monarch is trained in such a way that he can rule properly. That was the Vedic system. Even then, the monarch was controlled by great sages. In a proper government, the brahmanas and sages should form an advisory committee. They should not participate in politics. The ksatriyas, who are ambitious to rule, should rule under the guidance of the brahmanas and sages. Maharaja Yudhisthira was very pious, and people were very happy because he acted under the guidance of brahmanas and sages. Formerly, the monarch was guided by priestly, religious, or saintly people. That was very nice. This Krsna consciousness movement can guide society, but presently society is in such a state that it does not even want to consider the importance of this movement. This is unfortunate. Still, we have to struggle to spread Krsna consciousness because we are representatives of Krsna, and Krsna's desires are our commands.